The Black & White Check Cook Shirt is manufactured in 4.6 oz. 65/35 poly/cotton fabric. The polyester/cotton blend produces a more stain resistant and lower maintenance fabric than pure cotton. They are designed to be the hardest working shirt for the hardest working chef. The Check Cook | Utility shirt features a left chest pocket and a single row of black pearl buttons. 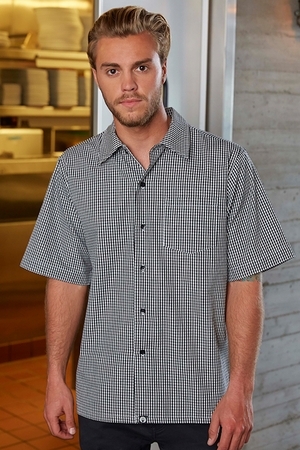 The Chef Works Check Cook | Utility Shirt is available in sizes XS - 4XL. Upsize charges do apply; please add $1 for XL, $2 for 2XL, $3 for 3XL and $4 for 4XL.